More bare-bones than we've seen in previous iterations, the Power Fist was manufactured pre-war and intended - as the bright yellow paint would indicate - to aid demolition. That said, it packs a mighty punch, with its power attack of a heavy underhanded thrust. 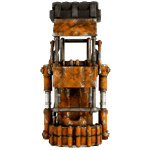 With penetrating mods, it can cause serious ballistic damage.